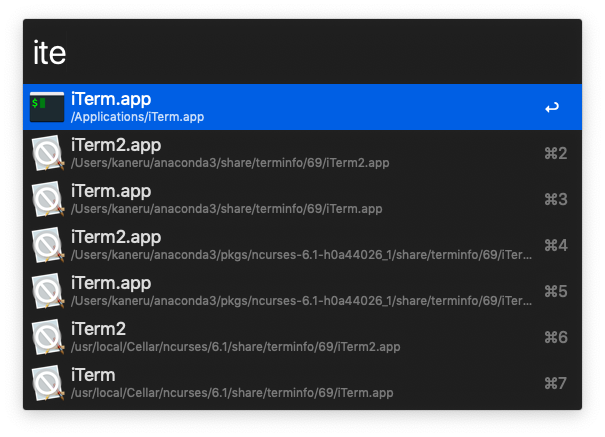 When I type "iterm" in the Alfred search input, a lot of dead instances of iTerm app appears. How do I solve this issue? Thanks in advance. You have a couple of options. You can remove the directories containing all the borked iTerms from Alfred's search scope, or you can individually add alfred:ignore to the Spotlight comments of each item (via Finder > Get Info). @kaneru Also, have you tried typing "reload" into Alfred first? This may clear any stale data from the application cache if the apps have already been removed.